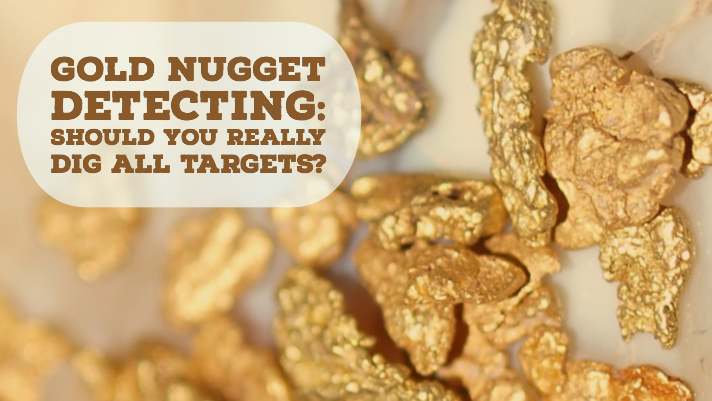 Gold Nugget Detecting: Should you Really Dig all Targets? Home > Gold Nugget Detecting: Should you Really Dig all Targets? Most people that try metal detecting for gold give up pretty quickly. Yep, that is the honest truth. I would bet 95% of the gold detectors bought today spend the vast majority of their time collecting dust in somebody’s closet. Very few people that go hunting for gold nuggets with a detector find any gold. The challenge of gold detecting is a topic for another day. However, one of the biggest reasons that makes people give up quickly is the abundance of trash targets that they find when they try to find gold. 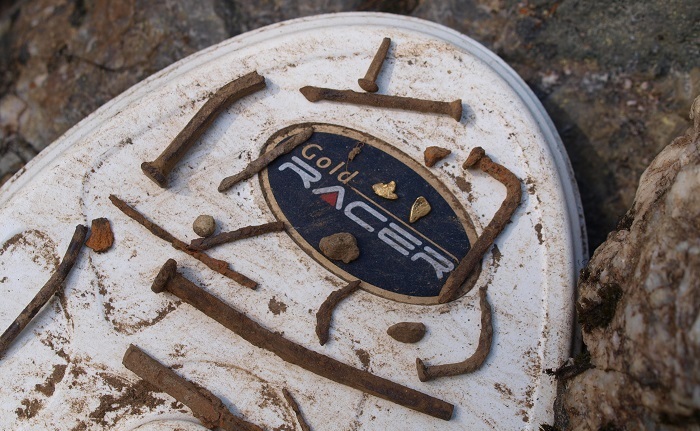 Even a skilled gold detectorist will spend most of their time digging trash targets, and might spend many days digging junk without finding any gold. If you don’t have perseverance to put up with the amount of trash you’re going to have to dig, then it’s pretty doubtful that are going to be very successful metal detecting for gold nuggets. If you have read much about gold detecting from the experts, you will hear the importance of digging all targets, regardless of the sound that your detector makes, or the ID number on the screen (on detectors that have visual indicators). So did you just walk by the target of a lifetime? It is absolutely possible that you did. A 20-ounce gold nugget probably sounds exactly like a beer can or any other large chunk of metal. Of course, I don’t even want to think about how many thousands of big trash targets there are for every multi-ounce gold nugget there are out there. If you want to make sure that doesn’t ever happen to you, then yes, you’d better dig all targets. There’s just no way to know for sure what is buried under the ground until you dig it up. Most VLF detectors today have pretty accurate discrimination, particularly for decent sized iron targets. If I am in an area with quite a bit of iron trash, and my target ID is giving a repeating and constant indication of iron, I might very well pass by it without digging. I can be pretty confident that it isn’t gold. However, if the target ID is bouncing around and inconsistent, I will definitely dig. Most detectors now have a feature that gives an overload signal on really big targets. Big chunks of steel, beer cans, railroad spikes, etc. Sure, it could be a gigantic gold nugget, but in all honest I usually walk past the overload signals. Sometimes you will walk into a big patch of targets and your detector will start going crazy because there are multiple targets with every swing. Closer inspection might show that there is a rotting piece of sheet metal and bits of iron scattered around the surface. Those targets you are hearing are just bits of iron that have rotted off the bigger chunk. I walk past these places, because you could spend all day just digging junk. You should know the area that you are prospecting. Some areas simply don’t produce large gold nuggets, and only have smaller flakes and picker sized gold. If you get a big, booming target you can be pretty confident that it is a piece of trash, since small gold will give a mellow, smoother signal. Yeah, I’m kind of joking here, but the truth is after a long day in the sun, I just might get a bit lazier than I am going to be at the start of the day. If the target gives some indication that it probably isn’t gold, I might just move on. Yes, this is probably bad advice and you should dig that target. If you find yourself getting a bit sloppy late in the day you are probably better off to find some shade or maybe head back to camp for a few hours, drink some water and maybe a cold beer and get your focus back. In all honesty, you should dig all metal targets while you are metal detecting. It is the only way to be absolutely sure that you aren’t missing any gold, and being selective about what you dig will without a doubt make you miss some gold eventually. However, the other consideration is how much time you are spending digging after those pieces of trash. If you are 99% sure that you are digging another square nail, and you are going to spend 5 or 10 minutes getting it out of the ground, perhaps your time is better spend hunting onward and passing by that signal? This is something I don’t see discussed very often, but we only have so much time in the day, and it may be more efficient to be selective to increase the odds of putting your coil over top of a gold nugget. Just remember, most of us aren’t gold prospecting to make a living, we are doing it because we enjoy it and want to have a good time. If you have a prospecting style that you prefer, then by all means do it. Ultimately, if you are finding gold nuggets then you are doing it right! Find a POUND of Gold Nuggets per Year!